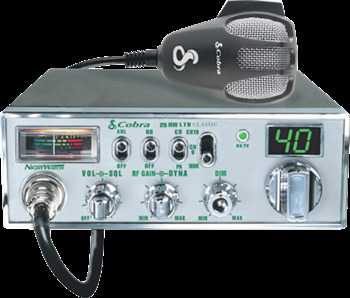 Cobra 25 NW LTD Classic With NightWatch® Display CB Radio Cobra 25 NW LTD Classic With NightWatch® Display CB Radio, Cobra 25 NW CB Radio, Vehicle CB Radio, Car CB Radio, Truck CB Radio, SUV CB Radio, Automotive CB Radio [Cobra 25 NW CB Radio] - $129.95 : 3rd Strike Performance, Your Source for Late Model MOPAR Performance Parts and Accessories! Now NightWatch comes to the 25 LTD Classic! The NightWatch series continues Cobra's unmatched tradition of enhancing safety and convenience for professional drivers. NightWatch technology illuminates the radio's function settings for easy viewing at night. The unique, solid-state, electro-luminescent backlighting is powered by a dedicated integrated circuit to maximize night vision while minimizing eye fatigue.